If you already know how to build websites? Then you can easily understand how to build mobile apps. People used to search for; What is the mobile application development? What is an html5 application? What is html5 for mobile? What language are the most mobile apps written in? What is a hybrid application on mobile? How to be a web and app developer that builds a lot of fun and interactive apps? What is the difference between a native app and hybrid app? What is meant by the native mobile application? Turning to HTML5 mobile application development; many existing and upcoming custom mobile app development companies are looking for mobile app developer to develop innovative mobile apps and reduce cost and complexity. HTML5 as the best cross-platform mobile app development framework allows the best web and native app elements for developing highly interactive native and progressive web applications. If you use in a right and efficient way, the HTML5 is the best replacement for the native app development. If you are running or a part of the company using different coding platforms, then you should give HTML5 a try at least, and I am sure you will love your decision. It becomes necessary for any kind of organization to think about implementing mobile apps across multiple platforms and it should at least consider HTML5 app development. Here I am going to guide you through the basic techniques you need to know about HTML5 Mobile Application Development to create professional and beautiful mobile applications. HTML5 mobile application development is the process for building the native apps, making the process easier so even inexperienced developers are able to develop the apps according to the requirements. Let's check out all about HTML5 app development. The HTML5 app is divided in two versions; HTML5 web application and HTML5 mobile application. Almost all the browsers support HTML5 environment which encourages the mobile app developers to use this optimized coding technique for a large range of devices. The HTML5 contains new APIs, multimedia objects, drag-and-drop functionalities, local caching, and much more. What is a native application? What is a native script? Unlike the HTML5, the native app depends on the native Operating System of the device. And so, it can be Windows, Android, iOS, BlackBerry, etc. Depending on the OS, the coding environment changes like Java, Objective C, Swift, etc. Thus, for a unique OS, there is a single native application. This means, whenever you are going to update, you need to update & test all of them individually. However, native apps are faster and more reliable than HTML5 apps. The best example of this can be the App Store from Apple which can reject an HTML5 app if it does not find it familiar (native) enough like a completely native application. What is a hybrid application on mobile? A hybrid application on mobile is a combination of HTML5 and native applications. It contains both the best as well as critical elements of these types though. Such apps are hosted in the native environment and embed with HTML5 techniques. A hybrid application looks exactly like a native app, and you can download it form your smartphone just like you do for the other PlayStore applications. The basic difference between a hybrid app and a native app is that the native app downloads the most of the content at the time of the first app installed on the device, while the hybrid application loads and displays the information as the user navigates through it. Facebook, Mobile banking app, etc. are examples of hybrid mobile applications. What is a web app? What is the difference between a native app and a web app? A web application is a local program that is installed on your device and performs different tasks on the internet. It uses the web browser & technology as a client. A native app is a device-targeted app which means mobile app developers build it for a particular system and directly store on the device. While a web app is an internet-based application which can be accessed by multiple devices using the browsers. You need to install a particular native app made for your device, while no need to download and install the web app on your device. You can download native apps from the Google PlayStore, Apple Store, etc. while you can access web apps anytime, anywhere using the internet and browser. Web apps can access only some of the features of the device on which it is being used, while the native apps have full access to all the features of the host device including the camera, GPS, gestures, etc. Native apps are faster to access and are more responsive than the web apps. Comparatively, native apps are costly than web apps. Native apps provide more consistency in user experience with the Operating System. You know that different operating platforms like Windows, Android, iOS, or BlackBerry, etc. need different languages to implement codes and programs. The PhoneGap from Adobe has overcome this problem by building a bridge between mobile devices and web applications. Using a single codebase, you can create a single application for multiple platforms and devices with the help of PhoneGap. As a result, no matter what your device is and what the Operating System it is based on, the app based on PhoneGap will run efficiently on it. Framework7 is an open source framework which uses HTML web skills for building iOS and Android apps. These apps can be either hybrid or mobile web apps. It is licensed under MIT and its latest version launched in Feb 2016. Framework7 uses the jQuery syntax which is easy and familiar to use without many efforts. It comes with a built-in grid system, FastClick library, and much more things for the responsive arrangement of elements, to control touch User Interface’s click delay as well as many other things. You got the knowledge about the HTML5 app and how it differs from other application types. You also got the knowledge of how it can be useful for you if you use the HTML5 development platform for the app creation. But, for building a particular platform-based app, you need to get familiar with its supportive and useful tools. It is a crucial tool to build an iOS application on a Windows or any other Operating System. It is a fully featured toolkit which comes with a Secure Socket Layer (SSL) protocol. As mentioned before, the Adobe PhoneGap will help to build hybrid as well as web applications using cross-platform web skills. You need not install the native SDK on your system; rather you can take help of Adobe cloud services to compile the apps. IcoMoon is based on Sencha Touch framework. It allows you to create customized icon pack for your application with the help of a fully organized and huge symbol library. BitBucket is a version of a distributed control system which allows having an easy collaboration between teams. You can store your repositories using Git & service like BitBucket. Check this tool now if you have not used it yet. It is a debugging tool which helps to debug the HTML5 apps even on the desktop PC. In a simple language, you can drag and drop the application into this tool on your PC at the time when you have attached your mobile device with the system. And yes, you need not to install the app on your device to do this. We got the familiarity for both mobile development and web development for different types of applications. But which is better among both? Well, let’s see the comparison of both the web & mobile development techniques to get the answer. The web libraries are more robust or say standardized than you can find for the mobile app developers. There is large community support for the web developers than the mobile app development. When you are building a mobile app, you know you will need to face bigger and slower iterations than in a web app. Web apps can have a more reliable connection than the mobile apps. But, wait. Don’t all these mean the web app is better than the mobile app? If yes, then now check the points below. A mobile app provides an ability to access and use the app even when there is no internet connection, which you cannot have in a web app. When you install a mobile application on your device, it can access your device features like camera, GPS, compass, etc. to give you more interactive, useful, and optimized data. You can also have fun by giving access to such features that cannot be done with a web application. When you use and navigate through a mobile app, you do not need to rely on the browser features like ‘address bar,’ ‘refresh button,’ or ‘back button’ as you do in a web app. According to research, 86% of the total time is spent on the mobile apps by the users, and the web apps only get 14% of that. Unlike a web app, when a user installs and uses the mobile app on the device, it also makes him remember the brand or designer name of that app. So, in one way, mobile apps work as a branding medium. Mobile apps are targeted for a specific niche of users, i.e., games, news, banking, e-wallet, office tools, education, etc. While the web apps reach to the various type of audience. Thus mobile apps are great at pushing the users to the conversion funnel. As the web apps rely on the internet connection, server response, browser support, and some other preferences to work smoothly, they are slower in response than the mobile apps. Both the notification types; push and in-app notifications are easy and quick to send via mobile apps. Which Platform Should You Go With; Web or Mobile App? As per the survey, nearly to 10% of users open an app only once. So, the first time experience of the user does matter, rather than the platform it is based on. 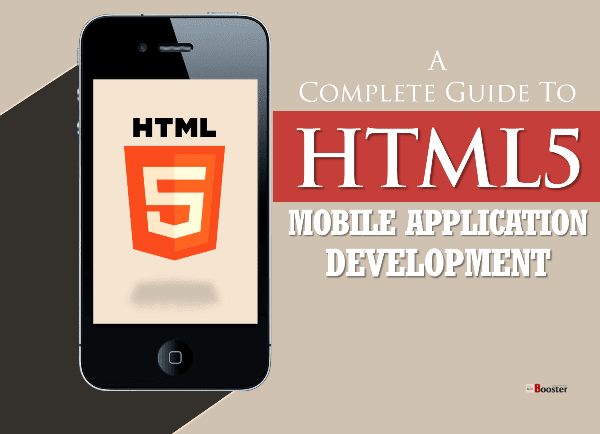 HTML5 undoubtedly provides an easy and efficient way for the mobile app development. If you have a coding background, it will be a lot easy to learn and implement HTML5 framework. There is nothing that comes without challenges, and it applies to the development platform too. Performance, security issues, server connection, and many other things that an HTML5 app developer needs to deal with. So, it’s better to have prior knowledge when developing a mobile app using HTML5 or any other web skills. Whether you are just starting your career as the mobile app developer or are a pro in the field, all your ideas, tips, questions, and experience matter. Share your thoughts in the comment section below. Article By Bhumi Patel - a technology geek always looking for new and cool stuff online. I like to share my thoughts and research to the people. If you want to explore more articles of mine, then visit Internet Geeks.